As I write this post I am sitting in the bathroom while Micah plays in the tub and trying to protect my computer from random splashes. I am taking just a few minutes to myself and pretending like every square inch of my house is not covered in misplaced toys, unfolded laundry, or dirty dishes. I don't know how things got so behind ... do you ever feel like that? Last Saturday we celebrated Josh's birthday at his parents house. We ate his favorite meal (grilled hamburgers) and I made his favorite birthday cake (funfetti with cream cheese icing). It was a nice night. Sunday and Monday brought stormy weather from hurricane Sandy. Josh was off Monday and Tuesday because of it. Luckily we didn't have any damage and didn't even lose power. Just a lot of heavy rain and wind and a lot of hanging out and coffee drinking. I realize that we are very fortunate; others were not so lucky. Monday afternoon during the worst of it. We didn't even have tree limbs fall. 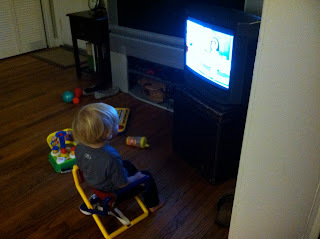 Our giant hand-me-down tv broke a couple of weeks ago and we have been tv-less since then. But in order for us to be updated with the storm, my in-laws donated one of their old tvs. Micah is a huge fan. Wednesday was Halloween and Micah and I went to the Harvest Party at our church. It had already been a pretty long day so we didn't stay too long, but we did get candy. What's Halloween without candy? 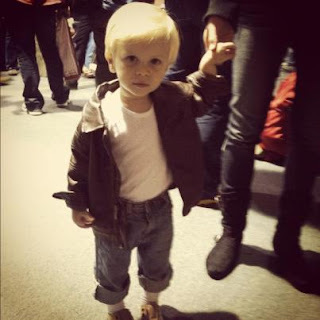 His "costume" - 1950's Grease Lightening. Luckily a friend got this shot ... he only kept the jacket on for two minutes! I had a doctor's appointment this week and will have one every week until Evie arrives. Everything looks good so far - I seem to be in no danger of going early. My doctor has implied that because Evie is not very big and I have very little (as in almost no) amniotic fluid, I might be more likely to go overdue since my body may not have the normal size cues to send me into labor. I pray that is not the case, but God knows what's best. This afternoon I was rocking Micah for his nap and he ended up falling asleep on my belly. I don't know if Evie noticed the weight of his head or if it was just coincidence, but she started moving around right under Micah's head. It was funny to see his little head bobbing up and down and knowing she was the culprit. What a little instigator ;) I hope those two really enjoy each other's company for as long as they are together. And I thank the Lord for memories like that too. So that's what we've been up to. Thanks for checking in on us ... hope you have a great weekend. Thank you so much for the cake!!! Funfetti -- our fave! Love you and praying as always! hahahah! Micah looks so happy there in front of the TV. .. Was he watching George? So what did Micah think of his feisty little sister bumping him in the head?